Many TV producers can only envy the success of “The Simpsons,” which has grown from an animated segment within “Tracy Ullman Show” in 1987 into the country’s longest-running sitcom. But now “The Simpsons” has found surprising success in the digital arena. 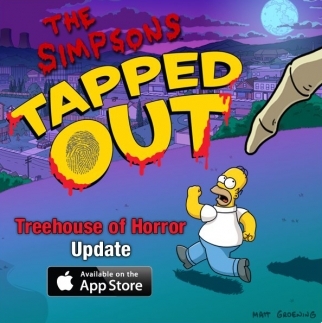 More people played the ‘Treehouse of Horror’ edition of ‘The Simpsons: Tapped Out’ than watched the Halloween episode on TV in the U.S.
“The Simpsons: Tapped Out,” EA’s “freemium” game for iPhone and iPad that has users building their own Springfields with characters and tasks closely tied into the show, attracted 6.93 million players in October for its “Treehouse of Horror” update, according to EA. That’s more than the 6.57 million U.S. viewers who watched the “Treehouse of Horror” episode on TV. EA and “The Simpsons” have previously partnered on a number of mobile games, including titles that predate the launch of the App Store as well as “The Simpsons Arcade” for Apple‘s operating system. But “The Simpsons: Tapped Out,” which requires a web connection to play, is the only live-service mobile game tied to a hit prime-time show. “Tapped Out” puts players to work rebuilding Springfield from scratch after Homer, distracted by his “MyPad” from his work at the nuclear-power plant, causes a meltdown. Users can speed the process with doughnuts either earned by completing tasks or bought with real money. Prices range from a dozen doughnuts for $1.99 to 2,400 doughnuts for $99.99. Players have used more than 3.1 billion doughnuts in the game, most of which were bought with real money, according to Steve Stamstad, VP-marketing for EA Mobile and Social Publishing. He declined to say how much money players have spent to buy doughnuts. The writers, animators and producers of “The Simpsons” are all involved in the development of “Tapped Out,” which includes outbursts from the well-known voices of cast members including Dan Castellanetta, Yeardley Smith, Nancy Cartwright and Hank Azaria. But the TV series and the game have gone further than that to promote one another. Aug. 26 and Oct. 7 airings of the show included commercials for “Tapped Out.” The Nov. 25 episode alluded to the game’s premise by showing Lisa win a “Mapple MyPad” for Homer at a school raffle only to have Homer become obsessed with the device until eventually falling and breaking it. ‘Tapped Out’ just got an update for the winter holidays. During the October “Treehouse of Horrors” tie-in, moreover, players were asked to tune in to find answers to trivia questions that would allow them to collect rewards in the Halloween edition of the game. The “Treehouse” update let users play with this year’s Mayan Homer character, make a “diddily deal” with Devil Flanders, ride a broom with Marge the Witch or enslave earthlings with Kang. Last month the game brought in the Fat Tony character, who then became the basis for a plot in the Nov. 18 episode. Earlier it offered players a Duff Racer car that was only available on the weekend of the season premiere, whose plot was set in motion when cars from the Springfield Grand Prix and bicyclists in the Tour de Springfield collide. Most recently the game introduced “Cool Homer,” a look that will be seen in this Sunday’s episode as Homer tries to fit in with hip new neighbors from Portland. The mobile games tend to see a boost in play time from the tie-in episodes in North America, according to Steve Stamstad, VP-marketing for EA Mobile and Social Publishing. EA plans an Android version of “Tapped Out” for early next year, Mr. Stamstad said. How do you like the new look of Yahoo ?